Everything you need to know about our software and our service. Our Radiology Management System (RMS) is a web based software platform designed to help Radiology organisations manage the non PACS/RIS duties of their organisation and spend less time and be more confident ensuring their staff and equipment are fit for practice. As a Radiology manager or Chief Radiographer, you can be rest assured you have the right tool to make these tasks quicker, easier, clearer, and more reliable. Our service includes free data entry so you are up and running with little effort. Subscribe to a cloud hosted version and recieve same day access or we can set up a server to install onsite in your location. All subscriptions include onsite training and are backed by 24/7 support with monthly, quarterly, and yearly subscription periods available. Customised packages also available (only pay for the features you need). Please contact us for a live demonstration at your site, or a 1 month online free trial. Real benefits for you, your staff, and your organisation. Designed for the Radiology sector - No need to make compromises or navigate through features you don't need. We are listening to the needs of the sector. Reduce expenses - Use the newly freed up staff time for something more valuable. An all-in-one platform to save you from having to pay for multiple systems. Increase Confidence - Be confident knowing your information is well organised and that alerts will be sent to you when anything needs attention. Increase Clarity - A clear, organised and searchable database that makes the important details obvious to you. Know when something expires and know who is assigned to manage it. Access Anywhere - A single place to login and find something. Access anywhere, any time, on any device. Assist with DIAS - A system to collect the required evidence for sections of the Diagnostic Imaging Accreditation Scheme. Have the evidence ready when the time comes to submit. Since our recent launch in 2018, our customer's are already sharing positive feedback. "Sensational. There's no better way to manage this information. A real time-saver." "I love the new messaging system. It is so much more efficient for me to send SMS to the staff, than spend time going through the roster and calling people. They are very responsive – someone always gets back to me immediately. Many staff have commented to me on how 'fair and efficient' the messaging system is. It is definitely working for our department." 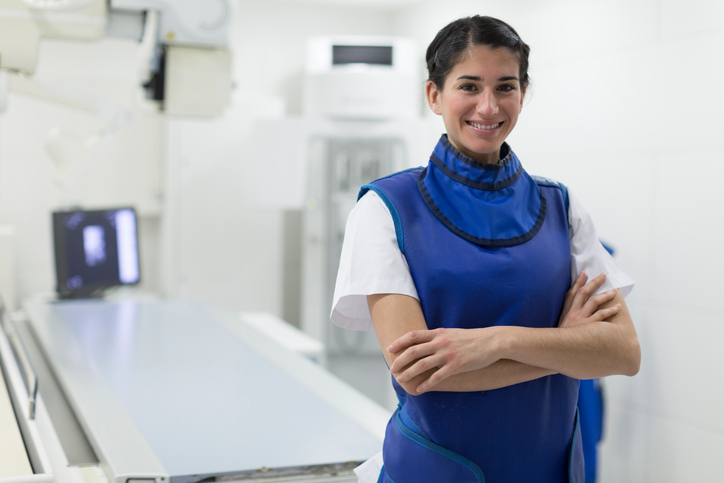 Everything you need to ensure your Radiology organisation stays fit for practice. Keep your records accurate, accessible and up-to-date, all in one place. 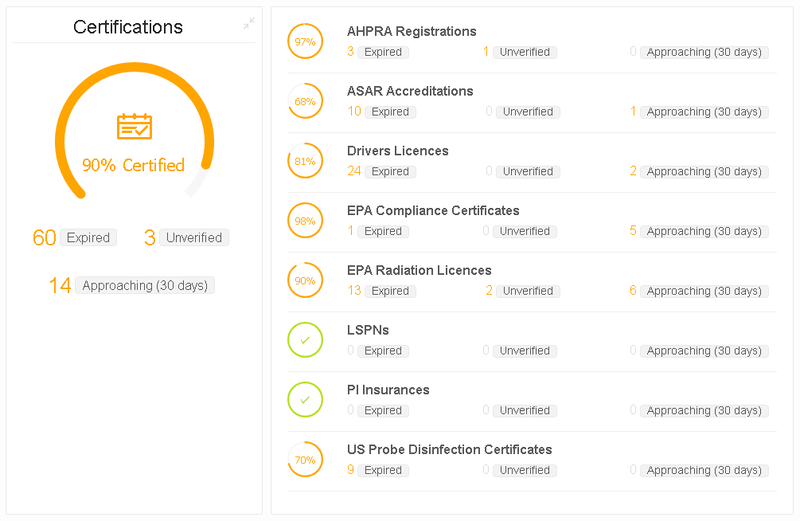 Manage Radiology certifications and their renewals, and receive alerts when approaching expiration (AHPRA registrations, EPA radiation licenses, EPA compliance certificates, ASAR registrations, LSPN's, Drivers Licences, and custom types). 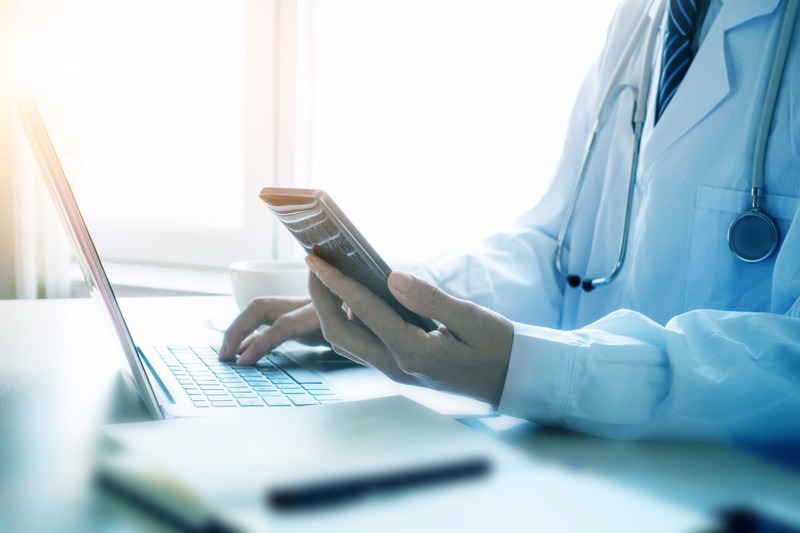 Manage Radiology contracts of different types and receive alerts when approaching their end date (Warranties, Leases, Service, Support, Reporting contracts, and custom types). Manage Radiology assets, their documentation, and their service records. Receive alerts when approaching end-of-life dates. Type a single SMS/Email message and send to hundreds of staff in your organisation by site, by role, or by skill (e.g. when experiencing PACS issues). Track stock levels for consumable clinical items such as Stents, Guidewires and Contrast media, and receive alerts when stock levels are low (coming soon in 2019). Have staff submit leave requests and setup automated rules to limit leave availability (e.g. 2 on leave with MRI skills at the same time). Allow staff to upload a copy of their certification renewals themselves and save you from having to seek them out. Renewal links are automatically sent to staff via SMS/email when they are due. Stay up-to-date with automatic email and SMS notifications that alert you of important events (e.g. when certifications or contracts expire). Assign items by site/department or individually to suit staff roles. No need to go hunting for data; just view the dashboard to see if anything needs your attention including when contracts complete, assets approach end-of-life, and when certifications expire. A secure, modern, and professional software platform built for the needs of the Radiology sector. Fully supported via phone and email with onsite training and support available. 100% Australian based software development and support. We take security seriously and are committed to running a secure, reliable, and available platform. We use many industry best practices including secure Unix based servers and SSL encryption for all network traffic. A clean, easy to use interface that is designed for simplicity. Only store the information you need. Access your data anywhere, anytime. No software or app installation required. Runs in your web browser on desktop, notebook, tablet and mobile devices. Customise to you needs; custom notifications, licence/registration types, contract types, leave types, and asset types. Add custom fields to record the information relevant to you. Use our software from a hosted version in the cloud, or have a server installed within your own network. Call or send us an email and we'll get back to you as soon as we can. Enter your email address and we'll get in contact.